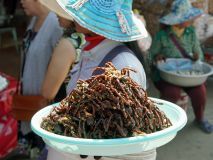 I first sampled "insect as food" back in 2002 when I was visiting Hua Hin in Thailand. I seem to recall that they were crickets and quite enjoyed them. Fast forward to 2018 and I am yet again in Southeast Asia, this time I am in Cambodia when I encounter "insect as food". 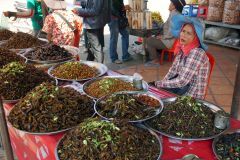 I didn't see insects for sale until I reached the tourist hotspot of Siem Reap. Wandering around the Night Market there were lots of vendors selling individual exotic insects, and arachnids, to the tourists. I saw lots of examples of small groups of tourists, most frequently young males, egging each other on to eat a tarantula or scorpion. The amount paid varied wildly since there were no prices, the cost was determined by how much the vendor could get away with, capitalism at its finest. I felt not the slightest temptation to sample the food these vendors were selling. However, I did start thinking about the fact that I had not noticed insects for sale in the the various markets I had visited over the previous few weeks. A few days after leaving Siem Reap I stopped for a break at a small market about 250km southeast of Siem Reap right on the NR6 highway near Skun. 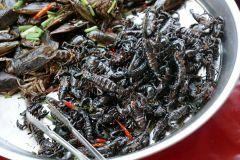 Finally I got to see insects for local consumption rather than for "adventurous tourists". The variety of insects for sale was huge, and unlike Siem Riep where a tourist would buy a single creature and often fail to eat the whole thing, here you could buy them by the kilo. Here, if all you wanted was an individual exotic insect or arachnid, you could choose a live one and get it cooked to order. With the scorpions you see them remove the sting first. On this occasion I did indulge myself with a deep fried tarantula with garlic. Pretty tasty but I'm not sure it tasted much different to any other deep fried insects with garlic. It is now several months since I visited Cambodia but recently I got around to buying a frame for some artwork I bought while I was there. This action prompted me to think back to when I bought the piece and what motivated me to buy it. With all due respect to the artist this is probably not a great painting it is however a piece of work that I like and a reminder of the events that led to its creation. In the years following the U.S. withdrawal of troops from Vietnam in 1975 the Khmer Rouge (Red Cambodians), led by Pol Pot, effectively took control of Cambodia which was renamed the Democratic Republic of Kampuchea. A very dark period dawned and the regime set about systematically dismantling the old ways and implementing an extreme form of communism based on peasant powered agriculture. Staples of society such as health care, education, cities, money, religion, families were not tolerated. So how does a single painting spark these memories? Well, among the plethora of forbidden activities were cultural activities which included art, literature, music… Among the literally millions (estimated ~2million +/- 1 million) of victims of this genocide were pretty much all the artists which destroyed not only the lives of individual artists but the teachers, role models and reservoir of local traditions. While in Siem Reap I was asked if I was interested in a visit to the circus, at first I wasn't that enthused but my interest was piqued when it was suggested that circus skills were another example of activities that were banned by the Khmer Rouge and whose practitioners had been killed. A short tuk-tuk ride west of where I am staying is Phare, The Cambodian Circus. It had been a long time since I had been to a circus and had no idea what to expect… I may have started out rather unenthusiastic but after sitting through the performance I was a convert, the entertainment value was outstanding. There were certainly some familiar circus skills displayed as part of the performance but the blend of music, dance, story telling, humour and athleticism combined to give tremendous entertainment. The common factor between these two examples of Cambodian culture, i.e. 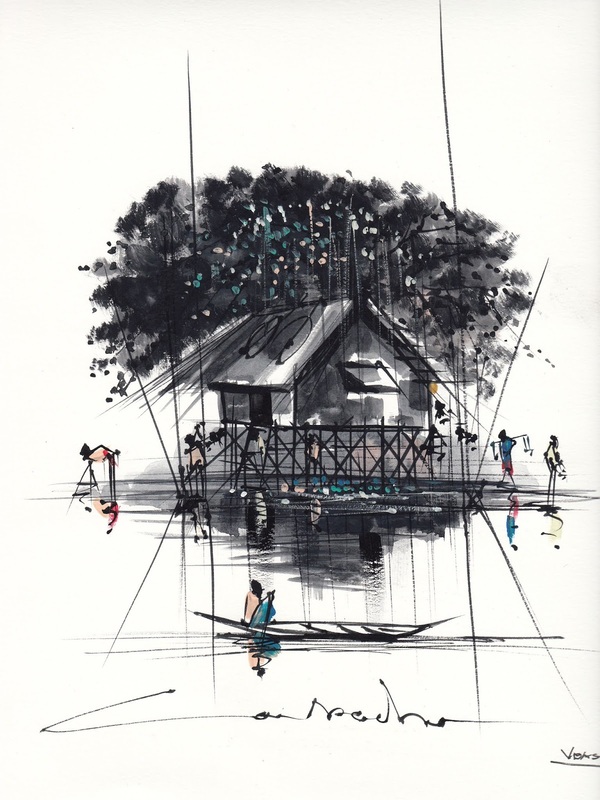 painting and circus, is the resurgence of interest and practice in these activities that were almost completely eradicated by the Khmer Rouge regime. More than a simple resurrection of the original practices modern Cambodians have sought help from their neighbours to regain some of the old skills but have also invigorated the old with more modern and experimental techniques. The results may as yet lack polish but are very exciting and even inspire admiration in artistic philistines like myself. 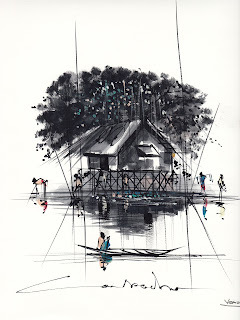 The painting that prompted this post was sold to me by the artist at Preah Ko, a small temple about 15 kilometers south-east of the Angkor temple. This post is another that stems from a coincidence. I have been quietly reading my way through the excellent trilogy Remembrance of Earth's Past by Liu Cixin and had reached the final volume The Dark Forest when I also chanced to read an article in the Economist entitled Where is everybody? . Both of these publications deal with the existence of extraterrestrial civilizations. The search for extraterrestrial intelligence (SETI) has been underway in one form or another for a long time and has, as yet, been unsuccessful. Along side SETI we also have METI (Messaging to Extra-Terrestrial Intelligence). While there has been some disquiet about our unintended broadcasting by virtue of electronic communications intended for others humans leaking out into the wider universe we have not stopped broadcasting to the far flung, unintended potential audience. At a meeting of the American Association for the Advancement of Science in 2015, Active SETI (METI) was discussed and questioned whether transmitting a message to potentially intelligent extraterrestrials elsewhere in the Cosmos was a wise. The Economist article summarises the Fermi Paradox and then briefly discusses an assessment of our progress with SETI in the search by a trio of astronomers at Pennsylvania State University. In a few words, our progress amounts to... not much. The fictional trilogy on the other hand is more focused on METI and how a lone researcher send a powerful message out into the Cosmos and gets a response, I will not spoil your pleasure should you care to read it for yourself. There are extraterrestrial intelligences out there but they may be quiet for a reason. Also in 2015 a statement was released, signed by many in the SETI community, advocating that a "worldwide scientific, political and humanitarian discussion must occur before any message is sent". I would agree with this position but honestly do not know whether I would be in favour of any such message or not. A new word, overtourism, has started to show up in the travel lexicon. The meaning of the term seems to be pretty self descriptive but has been used in subtly different ways, the proposed definition in the Collins Dictionary is short and pretty good but I prefer the wordier definition used by Responsible Travel. While in Southern Thailand earlier this year I came across an example of overtourism. 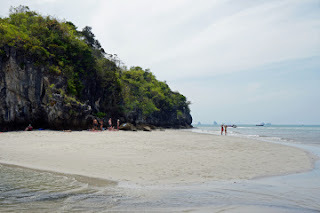 We were travelling from Bangkok to Singapore and one our stopping points along the route was Ao Nang, a town on the Andaman coast. Several of our travel companions took the opportunity to visit some of the nearby islands either by kayak or farther away by boat. Without exception everyone who went out to the islands encountered such a mass of tourists that the journeys were considered dismal failures. The problems were not simply the numbers of tourists but the behaviour of a non-trivial minority was sufficient for some to abandon the visit and head back early. Ko Liao from the sand bar, Ao Nang. So my earlier experiential claim is not really true, I was fortunate that my wife was unwell for a couple of days and didn't feel up to the required boat travel to get to the islands she really wanted to see. Instead I suggested that we walk north-west along the coast to Nopparat Thara Beach. It would seem that most tourists head off to the famous islands that feature in the must see lists or are not prepared to walk a few kilometers. We enjoyed our walk and found that there were very few people at Nopparat Thara Beach, at low tide you could just walk across to a number of small islands. Just off the beach you can find memorials commemorating those who died in the tsunami on December 26th 2004. While this modest little beach will hopefully never make on to one of the numerous Places to See Before You Die lists or Top [nnn] Beaches , I would rather spend my time here than at any of the cool places on these lists. To be fair this fascination with lists is not a new phenomenon and I guess this is something else we have to thank the ancient Greeks for since they are the ones credited with compiling The Seven Wonders of the Ancient World. The Hydrogen Sonata by Iain M. Banks. I've just completed reading The Hydrogen Sonata by Iain M. Banks. This book is one of The Culture series and centres on an aspect which has appeared in other novels but only explored in detail in this one, the notion of subliming . Like other novels in the series reading them is not an effortless exercise, there are many complex characters with difficult names engaged in a number of threads which eventually weave a compelling story. Along the way the notion of subliming is explained and provides some sort of alternative view to that provided by many religions. The background to the novel is the final days of the Gzilt civilisation before they are scheduled to sublime and some ancient intrigue as well as the actions of actions civilisations who want to exploit what is left after sublimation. While reading the novel I realised that this would be the last new science fiction novel by Iain that I would read since it is the last one that he wrote. I've read all his science fiction novels and a couple of his other mainstream fiction novels (as Iain Banks). I met him once at the Cheltenham Literary Festival and was wryly amused at his response to someone who questioned why he wasted his considerable talents writing science fiction.